[9 Reasons] Why Am I Not Losing Weight on GM Diet? 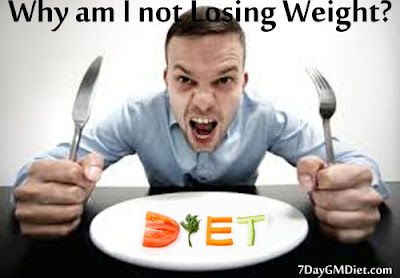 Recently, I got a few emails from the dieters who followed the GM diet plan, but didn’t lose weight as expected. They felt very bad about themselves for not losing pounds even after dieting for a week. Not just those, many people who’ve tried other diets like Military diet, Paleo diet or low carb diet etc… may also have encountered this problem at one or the other point of time in their life. It is advised not to think negative about yourself as it can hurt in the long run where your body may work against you. Not every time you may see positive results and it depends on several physical and mental problems, which we may or may not be able to control. You may not be able to lose weight if your hormones are not in balance. This may be the biggest problem mostly found in women. A lot of women who suffer from PMS, irregular periods, insomnia, mood swings, tender breasts, night sweats and fatigue are said to have a hormonal imbalance, because of which they won’t see any positive weight loss results even if they followed the diet properly. So, in such cases, it is better to consult your doctor and seek a medical advice to correct the hormonal imbalance. The thyroid is the major culprit for any sudden weight gain problems. If you’ve a slow thyroid, then you’re likely to gain weight and also won’t be able to lose it too. This is because the slow thyroid also slows down your metabolism. Luckily, the problem can be solved with proper medication. So, it is advised to consult your doctor. Generally, you get the vitamin D from the sun and this particular vitamin if low, can make you gain weight by slowing down the metabolism. Check with your doctor and he can monitor your vitamin D levels and suggest any supplements to fix the problem. This problem occurs majorly in the people who don’t go out frequently and face the sun, because the sun is the biggest source of vitamin D.
No doubt, we’re living in a competitive world, because of which our life has become stressful, especially in the case of women. When you’re under stress for long term, then your body produces a hormone called ‘Cortisol’, which causes an imbalance in your blood sugar levels. As you know, a spike in the insulin levels is a major cause of weight gain, especially around your belly area. So, try to avoid stress by practicing Yoga and meditation. Sleep is the best thing that makes our body gets refreshed and recharged when we wake up the following day. So, if you don’t provide proper rest (sleep) for your body, then you’re messing up with your metabolism indirectly. There is a hormone called ‘Ghrelin‘ in our body, which is an appetite stimulator. Whenever you’re not sleeping properly, then you’ll see a spike in the ghrelin levels. The more ghrelin you have, the more you eat. Likewise, there is another hormone called ‘Leptin’ which helps you eat less (appetite suppressant). However, lack of sleep lowers the leptin levels and the lesser it goes, the more you eat. Simply said, more Ghrelin and less Leptin is a sign of weight gain. So, it is advised to have at least 7 hours of sleep every night to have a lower BMI. Weight loss may not happen often due to unhealthy digestive tract. The major role of Gut bacteria is to help in food processing, absorbing nutrients and making hormones. So, an imbalance of Gut bacteria implies that your whole digestive system is off the track. Generally, bad bacteria is created/grown when you eat excess sugar or unhealthy fats. So, if you’re facing this problem, you should consider adding probiotics to your diet. The supplements may be costly, but you can get the healthy probiotics naturally from Yogurt, kefir, kimchi and sauerkraut. Excess intake of sugar, alcohol or caffeinated drinks can become a health hazard. When your liver is overloaded with work, it can’t process all the toxins (harmful) from your body and as a result, it either slows down or stops working temporarily, thus making you gain weight. So, to fix this issue, it is advised to follow a cleanse seasonally or whenever required. In a few cases, two biggest weight gain offenders include anti-depressants and birth control pills. These prescription medications may hinder your ability to lose weight. So, better find an alternative solution (natural) to such medicines by consulting your doctor. Not performing any exercise is definitely a major reason why you’re not losing weight. Also, doing the same exercise the same way, every day can also be a problem. You may hit the weight loss plateau for sure. To overcome the plateau, try to add weight training, yoga, cardio and Pilates separately over a period of time. Also, increase the intensity of your workout sessions with days passing by. Doing so can have very positive effects on the metabolism, thereby helping you lose more weight eventually. So, losing weight is not possible with diet or exercise alone. You should also cross check whether you’re suffering from any of the above physical or mental issues and fix them by seeking your doctor’s help. Only then, you’ll be able to get rid of those excess pounds around your belly or overall body.